Hey everyone! Long time, no see!!! I've been in Nevada for about a year and a half now and am missing Arizona right now! I will probably move back as soon as I'm done with my master's degree. In short, I'm attempting to remove the pro comp lift in light of a few things that I wish to do: not driving on bumps and having skid plates are at the top of the list. I hope everyone is doing well! Below is a post I made for the blue room to document my journey that will most likely culminate around Thanksgiving when I'm in Kingman with a *free* welder. Looking for some recommendations or some insights to anyone that may have undergone this delicate procedure. 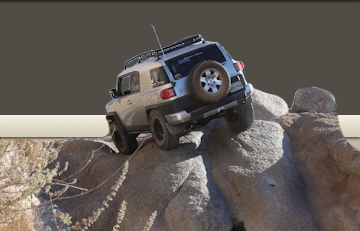 We've decided that the next best move for the FJ is to lower it from its current 5.5" state to a more reasonable and comfortable ~3" lifted state. The desire to undergo such a feat is primarily invoked due to an extremely uncomfortable ride caused by the ride height of the FJ being only an inch or so away from the bump stop locations. This means that hitting any kind of bump at a decent amount of speed means the occupants receive a nice jolt in the rear all the way to their head from the bump stops bottoming out. Long story short, because of the work I do and just general comfort we are ridding ourselves (HOPEFULLY!) of the 5.5" lift and "downgrading" to our measly 3". The good news: The suspension in the rear is basically done already, I need to purchase long travel rear springs from Metal-Tech to go with the already installed long travel shocks and that's done because there is already a bump stop spacer and extended brake lines installed. Anyways, thought I would make a thread to see if anyone has some insights as to what to expect or to remind me of things I may be forgetting about. As of now the main shopping list is: 1x Pair of MT Long Travel Rear Springs, 1 pair of front OME shocks and heavy springs to replace the front strut assembly; replacement steering knuckles for both sides, and whatever new bearings/seals I will need that goes with installing a new steering knuckle. I might also go ahead and gusset the knuckles while they are off the vehicle to prepare for the future. In short I'm just feeling out there to see if anyone else has done this OR thought of doing this and has any suggestions for my future endeavors. PS: I will be selling my lifted application ICON Coilovers that I will have rebuilt at a local shop. For 5-7" lifted applications so will fit both the Pro Comp and the Rancho 6" lifts. HMU! Miss seeing your FJ parked on campus next to that old Fiji House. Hope your masters is going well.